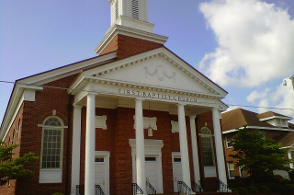 The Woman's Missionary Union is the mission education, mission action, and mission support organization of Fairfax First Baptist Church for women, young women, girls, and pre-school children. Its task is to teach, support, provide and interpret information regarding missions, and the work of the church and denomination through praying and giving. This organization promotes church-wide participation in the State Mission offering (J.D. Chapman); Home Mission offering (Annie Armstrong); and the International Mission offering (Lottie Moon). WMU also collects cards for distribution to St. Jude, collects and distributes packets for prisoners and health kits for migrant workers, distributes unused literature to other churches. Members promote the November World Day of Prayer and World Hunger Day. Members encourage prayer for all missionaries. Members also work together with all ladies of the church in providing meals to families in times of sickness and bereavement. The Ann Neil Group meets the first Tuesday at 10:00 a.m. from September through May. The purpose of this group is to be aware of the WMU work in the Allendale-Hampton Baptist Association and to participate in Associational projects. This group also sends cards to shut-ins and residents of the local Nursing Home and communicates with a missionary family in Peru. The group engages in special projects for college students and the military listed on the Church prayer list. We also provide aid to those in the community, when needed. This group appoints a Mission House Committee and Hostesses. For more information about WMU or how you can join, contact Nettie Sibley at 803-632-3267 or the church office at 803-638-3228.